Swimming pools have become almost as common as street lights in America. Besides offering a refreshing recreation option, pools provide great aesthetic value and are an attractive drawing card for apartment complexes, hotels and resorts. As a result, the U.S. is home to approximately 9 million pools, hot tubs, and spas, according to the International Aquatic Foundation. But pools also pose significant dangers. Property owners are required to take certain precautions to ensure the safety of their pools, including secure fences or enclosures, and proper maintenance of the pool surroundings and equipment. Yet swimming pool drownings claim approximately 10 lives every day, says the Centers for Disease Control and Prevention, and thousands more suffer nonfatal but long-lasting injuries in pools, hot tubs and spas. In addition to drownings, swimming pool accidents may include poolside slip-and-fall injuries, cuts and abrasions, neck and head injuries from diving, brain injury from prolonged submersion, and even disembowelment caused by suction from pumps and drains. 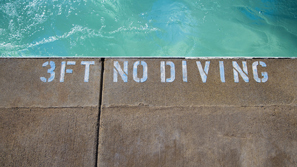 The premises-liability lawyers at The Law Offices of Frank L. Branson are able to litigate swimming pool injury cases. Our team of investigators and lawyers can help determine who was at fault – the property owner, the pool-maintenance company, the pool builder or the equipment manufacturer – and hold them accountable. In complex cases, we’ll use our multimedia expertise to create persuasive audio-visual evidence to support our client’s case, whether in court or at the settlement table. To learn more about our experience in swimming pool injury related matters, we invite you to contact the firm here.